The Bible says there’s a latter-day nation referred to as “Babylon” and/or “Daughter of Babylon.” We wrote an article about this nation proving beyond a shadow of a doubt that it can only be the United States. At the end of this article there is a link to the original piece that shows 22 reasons Babylon has to be the USA. One of the more interesting characteristics of this end-time nation, Babylon/USA, is that God uses her as a “war club” to militarily carry out His will around the entire earth. The Hebrew definition of “war-club” is “shatterer.” This is interesting as the U.S. pretty much shattered Germany in World War I and then shattered Germany and Japan in World War II. When there is no political restraint, the USA can take out anybody. There is another similar Bible reference to this country—calling her God’s military hammer of the earth. The actual Hebrew definition of “hammer” is “a forge hammer.” So we see that God prophesied that He would raise up this nation as His military hammer to move things along at the pace He desires—to forge or shape the country’s policies around the world to be aligned with His will. It’s not surprising that God does things like this as He’s in control of all things, even who is in leadership of nations. 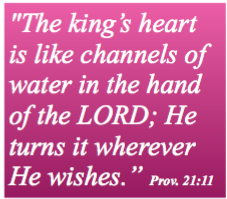 God says He literally puts kings and world leaders into and out of power. I can assure you that the reason Donald Trump is president is because God wanted him there. Continuing the policies of the previous administration was not what God wanted at this time. So the Lord lifted up thick-skinned Donald Trump to be president. God can use anything and anyone at anytime for His purposes. While most people reading this would prefer to have elected a president with impeccable past morals, God, in His sovereignty, chose a no-nonsense leader who was NOT politically correct in his thinking. I can think of NO other person who was running for office who could’ve withstood the constant barrage of media lies that President Trump has withstood. What he has accomplished is astonishing. If you’re not praying daily for his protection, shame on you! I can promise you, Satan HATES President Trump! God wanted this nation to be strong militarily, in order to be His war-club. God is using President Trump and the United States to currently be His military hammer on Syria. 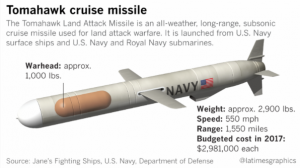 It’s also interesting that our weapon of choice against Syria is the Tomahawk cruise missile. A Tomahawk is a weapon shaped like a hammer. 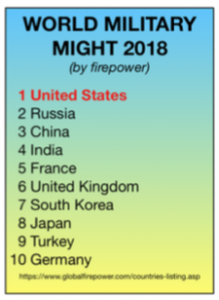 Many have wondered if we might have pushed Russia too far. Many liberals and conservatives alike have worried that President Trump, by his military actions, could trigger a war with Russia. After the Rapture things will abruptly change. 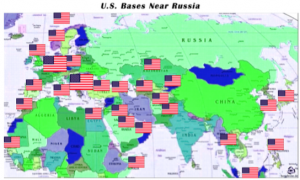 With the United States decimated, Russia and Iran WILL take the opportunity to attack Israel (Ezek. 38 & 39). So it’s not surprising that Russia and Iran are linking together today, if in fact we’re getting close to the Rapture. The word on the street in Israel is that the most recent drone attack against Syria had nothing to do with “chemicals.” Rather, it had everything to do with Iran! In February, Iran sent a drone loaded with deadly toxic gas into Israeli airspace. The drone was shot down and recovered, and Israel determined that it had been launched from a base in central Syria where Iranians had been covertly working. 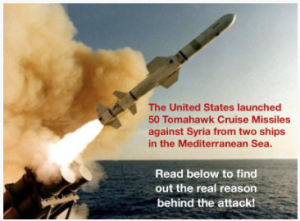 The recent airstrike from the U.S. against Syria was coordinated with Israel, something most news outlets didn’t mention. 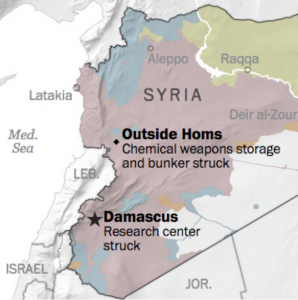 The U.S. and Israel struck the huge underground bunker complex near the town of Homs, which was full of Iranians. The Iranians were there developing chemical weapons… including the ones used against Israel in February. The complex was totally destroyed. Iran even admitted that Iranians were killed in these Syrian attacks. God’s purpose for bringing on this war is quite simple. Post-Rapture will be a new day—the time will have come when He will no longer be silent. Just as Egypt suddenly received the wrath of God, so will all the nations of the earth see God at work. But remember, all this happens POST RAPTURE in a Restrainer-less earth as the Church will have been graciously removed — we’re thankfully not appointed to be a recipient of God’s wrath. So if what we’re watching today is setting in motion what God will use to goad Iran and Russia into attacking Israel, we could definitely be close to our quite exciting exit. And during that time of post-Rapture Tribulation, God will allow the destruction of the United States. His War-Club will no longer be necessary as He will be pounding the earth from the heavens. You can get the video explaining the post-Rapture destruction of the United States HERE. The download is FREE. If you wish to have the DVD shipped to you, it’s $6.95. The printed version will also be included in a new Compass book that’s going to press this week. Details coming! So we keep our eyes up, looking for the coming of our Lord, not down on this temporal earth. There will come a time when the world as we know it will suddenly, without warning, change forever. In the meantime, our prayer is to be used by God in the lives of our friends, family and coworkers!